As mentioned in the last newsletter, my wife and I traveled to Mesa Verde National Park, Colorado a week and a half ago to extract an etheric plug that was suppressing a tremendous amount of Earth’s energy. First we had to locate it, and we accomplished this by getting direction from our guides on where to go in the National Park, confirmed it through kinesiology (muscle testing), and then once we got close, my wife and I each extended our senses to feel where the disturbance was located precisely. She felt the location within her fields, and I used my wings to locate it—we each identified the specific location independently for confirmation. The area with the blockage was about 50 feet in diameter and at the bottom of one of the canyons where the ancient cliff dwellers lived. After locating the plug, we were told to contact an intuitive friend of ours to get instructions for unlocking it. She proceeded to give us an array of five symbols to visualize and lay down on top of the plug in a specific sequence. As I am not that visual, my wife proceeded with this task placing each symbol with intention and toning. After all the symbols were in place, they rotated and moved into a multi-dimensional energetic construct to unlock the plug. Then it was my turn, and I began to use my wings to loosen and “dig” out the plug. When it was ready, I began to use my wings to slowly puuuuuull it out, and then cut “roots/cables” holding it down. Then it just floated up into the sky very easily and was taken away. At this point except for a little “cleaning” of the area we were complete, and began to feel a tremendous fountain of awesome Earth/Gaia energy flow up and out of the new opening into the surrounding area. After completing the work at Mesa Verde, we then proceeded to travel back to California, but on the way there we received another message from our ET friends that they wanted us to remove a similar etheric plug. We were told to go to a National Monument in Arizona, but we did not know which one. So I looked at a map and my wife googled for National Monuments in Arizona. 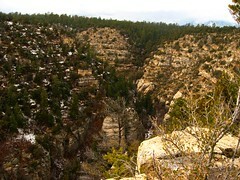 We muscle tested each one—one by one—getting a negative answer until we reached the last one Walnut Canyon. 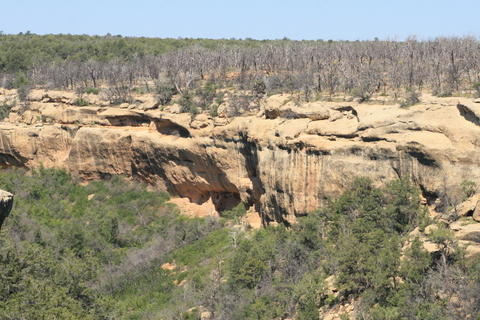 We researched to find out that Walnut Canyon was only 3 miles off of our route, and also found out that it featured archeological ruins of cliff dwellers just like at Mesa Verde. 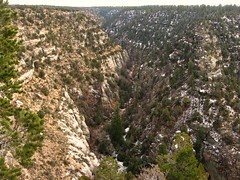 We proceeded to Walnut Canyon and at the visitor’s center were told that the trail down into the canyon that had been closed for many months due to construction had just re-opened that day. We were told that by our ET friends that we needed to proceed down that newly opened trail to locate the “site”. We began our walk just as the entrance to the trail was closing for the night and with only one hour until the park closed. Halfway down the trail we located the “plug”, and then my wife began to channel the language of the natives that had lived in the cliffs a thousand years ago. After she completed the invocation and “unlocking”, I again used my wings to loosen, dig out, and lift the plug with my wings. Again as in Mesa Verde, after the “cables” were cut the plug floated up and away easily releasing a well of golden Earth/Gaia energy that felt wonderful and nourishing. I connected to the native cliff dwellers and immediately received an overwhelming sense of gratitude. I asked why they had left the canyons and cliffs, and was told that after the well of Earth’s energy was plugged, the area became less hospitable, harder to sustain life, and contained less spiritual energy. I felt honored to have been able to participate in the first steps for renewal of the area and the possible return of people living in the cliffs. Our next engagement will be similar to Mesa Verde and Walnut Canyon, where we will travel to another location and perform similar work to clean out and remove the energetic suppression of Gaia. If you would like to participate, please contact us, and we will let you know how you can support this effort. You may also contribute financial energy to this mission by making a donation on the “Services” page of the CleaningWings.com website. I am blessed and honored to be able to participate in the Ascension and liberation process in this way. 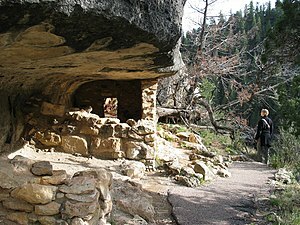 This entry was posted in Newsletters and tagged Mesa Verde, Mesa Verde National Park, Vortex, Walnut Canyon National Monument on March 5, 2013 by Kunde-Ra.